Masses within the eye can be caused by many things, such as immune-mediated disease, cystic change, coagulopathies, infection, and neoplasia. 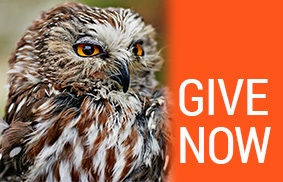 The owner may bring the animal to you after noticing a dark spot within the eye, a change in the pupil’s shape or movement, a white or red appearance to the pupil, or signs consistent with glaucoma. Or you may diagnose the mass on routine exam, and the timing of the mass’s development may be unknown. As with any other clinical finding, taking a systematic approach with these patients can help you narrow the list of etiologies. The first step is to perform a complete ophthalmic examination including anterior segment and fundic exams. If it is safe to do so, dilating the pupil can help you to determine if and how much of the iris is involved, and also provide a better view into the fundus to assess the size of the mass. It is important to measure the intraocular pressure before and after dilating the pupil as sometimes intraocular masses can impinge on the drainage angle and lead to secondary glaucoma. After completing your ocular examination, interpret your findings in the context of the rest of the physical examination. Finding a red iris mass in a patient with petechial hemorrhages in the retina and elsewhere on the body raises the suspicion of bleeding disorders and warrants further systemic workup. A focal thickening of the iris is often neoplastic, whereas a more diffuse thickening of the iris is more often inflammatory and warrants a uveitis workup. Most masses within the eye are neoplastic, whether it be primary or secondary. Uveal cysts are benign intraocular masses that form due to poor adhesion between two layers of tissue in the iris or ciliary body. Cysts are more common in dogs but have also been reported in cats, particularly after trauma. Uveal cysts can range in color from dark brown or black to clear and may be influenced by iris color of the patient. These cysts are smooth, round, and typically somewhat translucent such that light can be seen to pass through them when the eye is transilluminated in a dark room. Iris cysts in a dog. Note the round, smooth shape and ability to visualize the cataractous lens through the cyst. A darkly pigmented intraocular mass, whether located in the front or back of the eye, is commonly melanoma or melanocytoma, the behavior of which varies by location and species affected. If you find a dark spot on the iris or retina/choroid, it can be difficult to determine if the area warrants concern. Pigmentation patterns can vary in the fundus. Sometimes the tapetal-nontapetal junction is crisp, whereas in other patients the junction is more blurred with splotches of pigment that blend into the tapetum. Comparing one eye to the other can be helpful in these cases as pigmentation patterns in the eyes are often somewhat bilaterally symmetrical. Also remember that blue eyes are much less pigmented (anterior and posterior) than green or brown eyes. Pigmented spots in the iris are often benign nevi or freckles. If, however, the pigmented area is growing in size over weeks to months, is raised or changes the surface texture of the iris, or alters the pupil shape, size or ability to constrict or dilate, this suggests the iris tissue is being infiltrated by something and makes the area more likely neoplastic. Iris melanocytoma in a dog. Note the raised, darkly pigmented mass and that the adjacent pupil does not dilate as well. Tumors within the eye typically originate from the uveal tract, given it is the primary blood supply to the eye and very metabolically active. If you are suspicious of an intraocular tumor, performing an ocular ultrasound can help determine tissue of origin. Some tumors are visible in the iris but actually originate from the ciliary body and grow forward to invade the anterior chamber through the iris or drainage angle. Using an ultrasound probe specifically for eyes is ideal. However, you can also use a tendon probe or abdominal probe with a standoff made of an exam glove finger filled with gel or water and placed between the eye and the probe. You can also use a large blob of ultrasound gel as a standoff, but this can be frustrating and very temporary in an awake patient that won’t hold still. Intraocular tumors can be primary (originate within the eye) or secondary to metastatic disease. Secondary tumors tend to cause more inflammation within the eye or even sudden hemorrhage. If you suspect the tumor is secondary or that a primary tumor may have spread elsewhere in the body (as is possible with feline iris melanoma), a systemic workup is warranted and should include lymph node palpation with FNA of any abnormal nodes, thoracic radiographs, and abdominal ultrasound. Intraocular tumors in dogs are often benign, such as iris melanocytoma or iridociliary adenoma, but malignant melanoma has been described. Masses originating in the posterior segment, such as melanoma or medulloepithelioma, can be benign or malignant. In addition, secondary tumors such as lymphoma and histiocytic sarcoma often have a more aggressive nature. A more rare type of spindle cell tumor can develop in blue-eyed dogs (also known as Uveal Schwannoma of Blue-Eyed Dogs), most often reported in the Siberian husky, Australian shepherd, and Catahoula leopard dog. 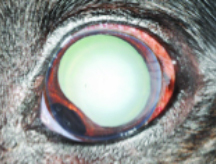 Regardless of appearance, any intraocular mass in a young dog should be taken very seriously as malignant nature is more likely in this patient population. Intraocular tumors in cats are generally more malignant in nature and include diffuse iris melanoma, feline post-traumatic ocular sarcoma, and iridociliary adenoma. Feline post-traumatic ocular sarcoma (FPTOS) is a particularly malignant tumor that is believed to develop following ocular trauma (blunt or penetrating) that damages the lens. The tumor takes months to years to develop following the trauma, therefore long-term follow-up with complete ocular exams (including dilated fundic exam) yearly or twice yearly is imperative following ocular trauma in cats. For any cat with a history of ocular trauma in which the eye(s) is permanently blind or has extensive pupillary adhesions or cataract formation that impairs performing a full fundic examination, enucleation of the affected eye(s) should be strongly considered. This is because once an FPTOS is large enough to be seen in the anterior chamber, it has often already metastasized to the brain. Some intraocular masses can be identified through fine-needle aspirate, which may help avoid enucleation. This procedure is best performed by an ophthalmologist with a fine-gauge needle in an anesthetized patient. Recently, iris biopsy techniques have been described and result in far fewer complications than previously thought. Some iris masses are also able to be removed with intraocular surgery with or without adjunctive chemotherapy. However, in order to confirm the true identity of an intraocular tumor, enucleation is often necessary. If the mass is rapidly changing, you suspect malignant nature of the mass, or it is causing refractory uveitis or glaucoma, the eye should be enucleated and submitted for histopathology. It is very important to a successful diagnosis to ensure that the laboratory or specific pathologist has experience in examining ocular tissue, because the diagnosis may not be clear cut. If the tumor is secondary, spread to the eye from another location, enucleation may not be necessary as some tumors, such as lymphoma, respond well to chemotherapy. If the eye is painful, such as with secondary glaucoma or uveitis, and fails to respond to treatment, enucleation should be considered for long-term comfort. Once armed with a diagnosis, whether that be via cytology or histopathology, you can determine if systemic workup, long-term monitoring, or adjunctive therapy such as chemotherapy or radiation is warranted. For more information about managing intraocular masses or tumors in your patients, please do not hesitate to contact the University of Illinois Ophthalmology Service either by phone (217-333-5374) or email (vet-eyes@illinois.edu). Every effort is made to return consult calls and emails the same day or within 24 hours. 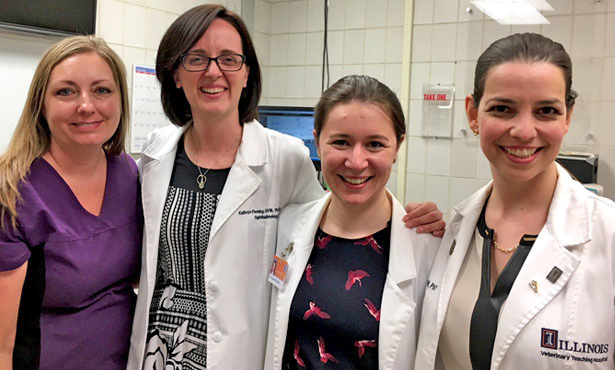 For more information about systemic workup or adjunctive therapy options in patients with intraocular neoplasia, you can also contact the University of Illinois Oncology Service at 217-265-4977.